Double Halo Diamond Engagement Ring in 14k Two-Tone Gold | Shane Co.
Sixty-four brilliant round diamonds, at approximately .49 carat total weight, dazzle in this stunning engagement ring. 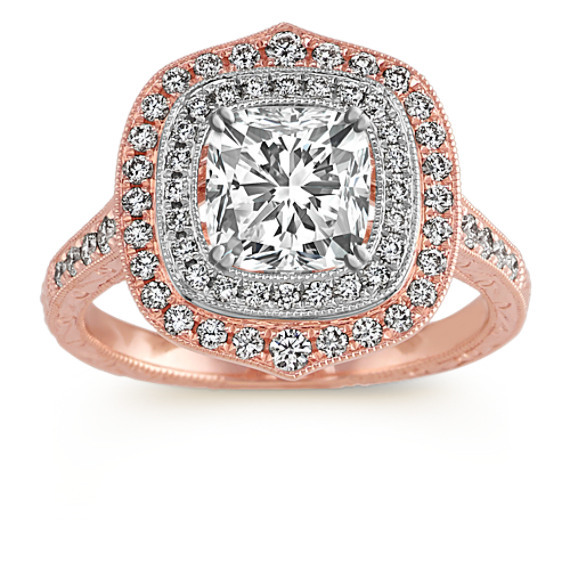 This vintage double halo design includes intricate milgrain detailing and is crafted from quality 14 karat rose and white gold. The ring measures 15mm wide at the halo and 2mm at the band. The shimmering ring design is the perfect backdrop for the cushion cut, princess cut, or round gemstone of your choice at approximately 1.00 carat. Gemstone Carat Weight :1/2 ct.